Another month has nearly passed, which means it’s time for Game Night Blog Carnival once more. I’ll be joining several other RPG blogs for some reviews of board and card games, much different from the typical D&D fare. This month, though, I’m staying with the fantasy theme and covering one of my favorite old school games: Talisman. Back in the early 80s, there was a surge in the popularity of the fantasy genre. Dungeons & Dragons was probably the biggest influence, but there were many other areas where swords and sorcery showed up. Conan and the Beastmaster hit the box office and got heavy rotation on cable TV. The popularity of Tolkein and many other genre authors soared. Board games even got in on the action, and many now classic games were released: HeroQuest, DungeonQuest, the original Dungeon, and the first edition of Talisman. I didn’t get to play Talisman until the mid 90s, but I absolutely loved it. A couple of years ago, I was reminiscing about the game with a friend, and he produced a copy of the third edition. His kids were a bit young for it, while mine were older, so he sold it to me at a great price. I was thrilled to have a favorite game in my collection again, and even more so when I played several games with my kids on a long break from school due to snow days. 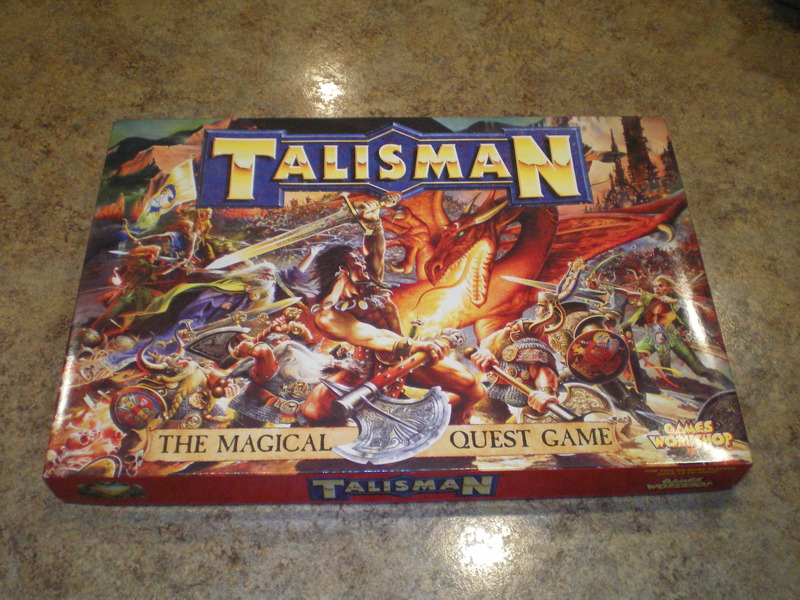 Talisman is described as “The Magical Quest Game”. Players take on the roles of a cast of characters ranging from the noble Wizard to the evil Minotaur. The goal is to journey to the central tower, defeat the Dragon King, and obtain the Crown of Command to obtain victory. Along the way, characters must visit various locations around the board. Here, they might have to battle monsters, defeat spirits, obtain magical items, attract followers, or even get turned into a toad! As each challenge if overcome, characters get stronger and more capable, the better to potentially defeat the Dragon King. The eponymous Talisman is a magical item that must be obtained in order to safely enter the Dragon King’s tower. While the Talisman can come up randomly at any location, this occurrence is very rare. Thankfully, you can go on a quest given by a strange hermit to obtain a Talisman. The quests include defeating a monster, spirit, or even another player in combat. When you meet the hermit’s conditions, he teleports you to his location and gives you a Talisman. 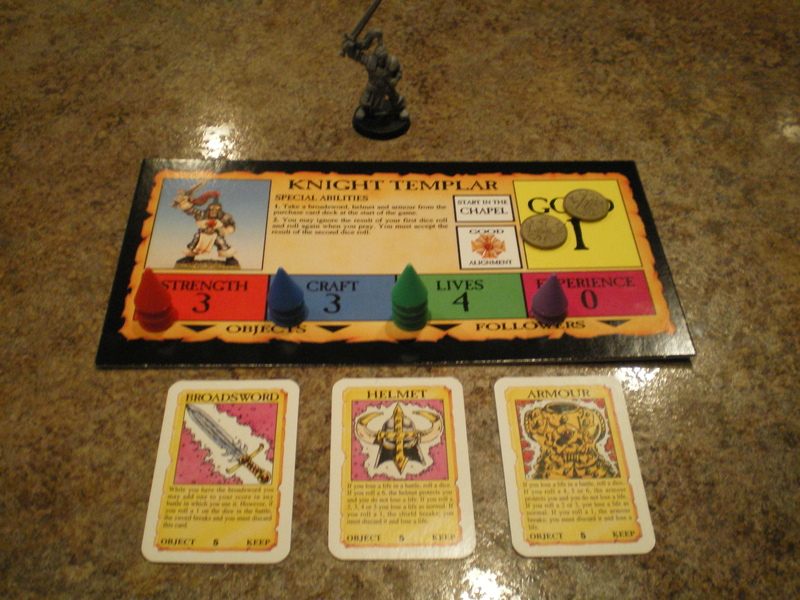 The components of this, the third edition of the game, are very nice. Games Workshop gave Talisman a coat of Warhammer Fantasy paint, so to speak. Creatures like the Skaven rat man are included as playable characters, and the art style features lots of spikes, skulls, and other grim depictions. The best part of the game are the large, highly detailed miniatures, which are among the best I’ve ever seen in a game. Included in the box is a painting guide, though I’ve not (yet) had the chance to decorate mine just yet. The other bits are nice, too, especially the colorful, stackable cones that are used to represent each characters stats: strength, craft (magical power), lives, and experience points. Talisman is certainly not the most strategic of games. There are very few truly interesting decisions to make. Some may see this as a disadvantage, but I think these folks are missing the point. Talisman is a dice rolling fest; it’s a social game through and through. The fun comes not from the brilliant tactics you employ, but rather the interaction with the other players. You’ll laugh when a friend encounters a powerful devil and loses his last life, reincarnating as another character. You’ll hunt down your buddy if he manages to obtain that perfect magical item so you can defeat him and take it for yourself. At the end of the night, you’ll have some great stories to share for a long time, like the time you drew the Finger of Death spell and killed the Dragon King outright. Though there is little downtime between turns, Talisman can go on for several hours if you use the default rules. We changed the rate at which experience points are turned in for strength and/or craft from 7 to 3, and this helps considerably. We also ruled that you may choose to move one space rather than rolling, which avoids the problem of not being able to visit a key location due to the luck of the dice. These little changes have made the game even more enjoyable and fast-playing for us. 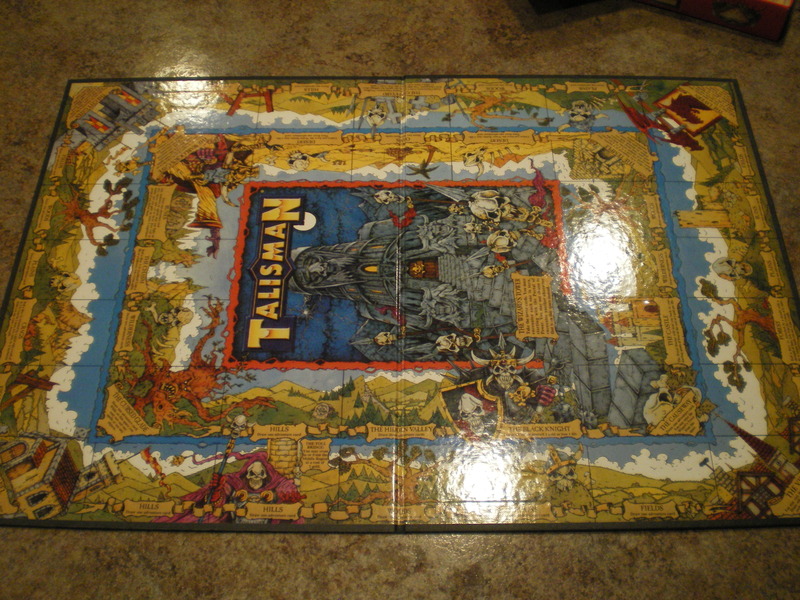 Talisman is a classic board game, well-remembered by many, and for good reason. It’s an excellent light board game with a well implemented theme. Though the 3rd edition is out of print, a new edition has been published, with many expansions, by the excellent crafters at Fantasy Flight Games. If you have the chance, get a few friends, grab a cold beverage, bring a bowl of potato chips, and go on a magical quest in the world of Talisman.